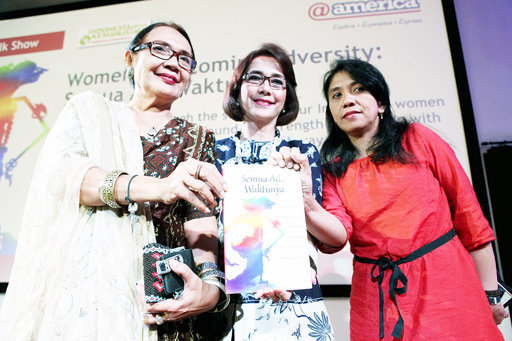 Memento mori: Magdalena Sitorus, Widyawati and Suciwati pose with Magdalena’s book Semua Ada Waktunya (All in good time). When human rights defender Munir Said Thalib was murdered on a plane en route to Amsterdam in 2004, late former secretary-general of the National Commission on Human Rights Asmara Nababan investigated the killing and urged president Susilo Bambang Yudhoyono to release the report his team made to be used at trial. Six years later, Asmara died in Guangzhou, China, from lung cancer. The mastermind behind Munir’s killing remains unknown. Women’s rights activist Magdalena Sitorus, Asmara’s widow, share her connection with Munir’s widow, Suciwati, through Munir’s death. They have also been sharing their experience of grief from losing loved ones in a book by Magdalena. In an attempt to make sense of her grief, Magdalena interviewed Suciwati and four other women: Widyawati, the widow of former actor and lawmaker Sophan Sophiaan; Shinta Nuriyah Wahid, the widow of former president Abdurrahman “Gus Dur” Wahid; Damayanti Noor, the widow of singer Chrisye; and Saparinah Sadli, the widow of late professor Sadli. Magdalena published a book Semua Ada Waktunya (All in Good Time) last year based on her journal and the interviews with the five women. She said she was worried about her psychological state after Asmara’s death and writing became her refuge. “I’ve always wrote in my journal, it’s a long-time habit,” she said at a talk at the @america cultural center in June. Magdalena, Suciwati and Widyawati sat in front of an audience to talk about their experience in facing the loss of their husbands. “It’s not easy to talk about something that’s unpleasant. But if by this I can share my experience, motivate people and make them aware that there are unpleasant things and that we should improve them in the future, I don’t mind,” Suciwati said. Suciwati has relentlessly fought for the murderers of her husband to be found and tried. In December, in advance of Munir’s birthday, Suciwati launched a new campaign calling on the public to sign a petition asking President Yudhoyono to bring Munir’s killers to justice. Former Garuda Indonesia pilot Polycarpus Budihari Prijanto has been sentenced to 20 years in prison for his role in the death of Munir. Polycarpus has appealed the verdict. Suciwati, who lost Munir while their children were still very young, said she faced some challenges in explaining the assassination of Munir to their children. She said that several years ago, her children would say that they would not want to become activists. “’I’ll be murdered like my dad’,” Suciwati recounted her son as saying. “I tell them that what their father did was amazing, how he humanized people and fought for humanity. Those are the things that we should remember,” she said. “It’s not easy when they ask why their father was murdered or when they are angry with Polycarpus. In these situations I present them choices: ‘Will you choose to be like Polycarpus or will you choose to be like your father? What your father has done is meaningful, remembered, the values that he brought should be continued’,” she said. Now, when family friends ask her son Sultan Alief Allende about his aspirations, he answers that he wants to be a film director to promote human rights through film, Suciwati said. Suci now lives in Malang with her children and is working on a museum to celebrate his life and values. Suci said that advocacy work is tough, due to the corrupt system in Indonesia. “We can see the state of law enforcement in Indonesia, how the officers are like, how the top ranking officials are like. When we talk about the law we can be heart broken,” she said. Widyawati shared the similar feelings after losing Sophan Sophiaan, who died at 64 in a motorcycle accident while participating in a motorcade across Java in celebration of the National Awakening Day centennial. “I never thought or expected to talk here about my husband who has passed a way. It does hurt. And like mbak Suci, I still have a question mark until now,” she said. Widyawati said that the years of being spoiled by Sophan’s love left her unprepared in living independently. “I just didn’t know what to do,” she said. Luckily, her family guided her in the minutiae of paperwork, taxes, bills and such. Magdalena’s book also touches the stereotype placed on widows and how society perceives women. “I live in a society that doesn’t appreciate women or have a negative view on women,” she said. Suciwati said that a Muslim cleric told her to stop her public activity and to stay at home and pray and take care of her children.